1. Special guests David Suzuki, Emma Donoghue, Ron Sexsmith, and more! At the Amazon.ca Bestsellers Stage, David Suzuki will present a reading from his latest book Just Cool It!, Emma Donoghue will present her first novel for kids The Lotterys Plus One, and Ron Sexsmith will present his Deer Life. 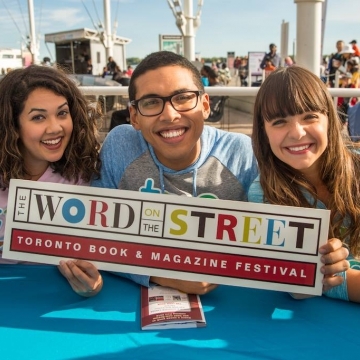 Suzuki will also read from his book Letters to My Grandchildren followed by a Q&A at the TVOkids Stage. 2. Participate in Franc’Open Mic, a free slam poetry workshop in French. Actor, improviser, and screenwriter Florian François and singer-songwriter Cyril Mignot will host the popular Franc’Open Mic followed by a special slam poetry contest on stage. 3. Join a bestselling lineup of authors for four 60-minute Author Cruises on a beautiful ship. Themes include Toronto sports, man and god, historical fiction, and good v.s evil. 4. Visit the Cooks ‘n’ Books Stage for demonstrations, talks, and tasty samples inspired by Canada’s latest and greatest cookbooks! Discover Indigenous cuisine with Chef David Wolfman, learn back-to-school recipes with Laura Keogh and Ceri Marsh, and more. 5. Sing, dance and learn at TVOkids LIVE! and explore the TD KidStreet Marketplace for new reads for the school year. Families can enjoy a fun-filled day with some of TVOkids’ favourite characters and personalities, including Pirate Bookaneers, math mystery agents from Odd Squad, popular canines from Paw Patrol, and paleontologist-in-training Dino Dana. 6. Brush up on your French at the new TFO Franco Stage. There will be readings with authors such as Monia Mazigh (Du pain et du jasmin) and Michel Noël (Le Pensionnat), a celebration of the 30th Anniversary of the Trillium Book Award, a Mini TFO show for kids, and a French riddle challenge from Alliance Française Toronto.